Martha Helen (Kostyra) Stewart was named after her mother (Martha, though she was originally named Jadwiga) and paternal grandmother (Helena). All four of her grandparents were Ellis Island era immigrants from the southeastern portion of Poland with her paternal grandparents -- Helena Krukar and Franciszek Kostyra -- coming first (1904 and 1905, respectively) and her maternal grandparents -- Josef Ruszkowski and Franciszka Albiniak -- arriving slightly later (1910 and 1912). If you have any of the following surnames in your family tree, you could be a cousin of Ms. Stewart's: Adamczyk, Albiniak, Baran, Ciman, Flis, Grab, Grosiewicz, Grysztar Kak, Kielar, Kisielinska, Kiszka Kostyra, Krol, Krukar, Krulicka, Kulpa, Lach, Lazinska, Litwin, Macuga, Misiak, Okon, Oleszko, Orzeł, Penar, Rajchel, Ruszkowski, Rygiel, Rzad, Siwy, Skubik, Strzalinska, Tomczyk, Wasi, Wojtan, Wolyniec and Zukowsa. Though assorted domestic skills are found throughout her family tree, it's her paternal grandmother's line that seems to have passed on the cuisine gene. Among her Krukar grandmother's immigrant siblings were a grocer, butcher, saloon keeper, and steward at a restaurant. The grandfather who married this Krukar grandmother was originally a basket maker, but quickly blended in with his wife's family, working as a waiter, butcher and restaurant merchant. Sadly, like so many immigrants, her Kostyra grandparents lost a child. Their firstborn passed away when her grandmother was pregnant with Martha's father. Her paternal grandparents were seemingly better off than many immigrants as they were able to send their son, Edward (Martha's father), to Europe twice when he was in his twenties. On the later trip, he traveled on the Batory, coincidentally the same ship that a relative of Lisa Kudrow's worked on in the late 1940s when he came to America to tell his relatives what had become of their relatives in the Holocaust (as seen in an episode of Who Do You Think You Are?). Martha's grandfather, Frank Kostyra, owned a tavern in Jersey City. 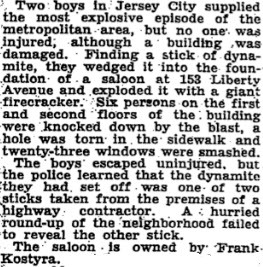 On the 4th of July in 1929, two boys stuck a piece of dynamite in the foundation of the tavern causing an explosion that did considerable damage, but fortunately did not injure anyone. Given the pace of change in major cities, it's somewhat remarkable that the building is still a tavern today. In spite of such inherent difficulties, Slavic research is much more doable than many think. It is possible, for instance, to trace at least a dozen of Martha Stewart's lines back to the 1700s. A Polish relative of Martha's recalls having a tough time getting a job as a teacher under communism because he admitted having family members in the U.S., and whether she knows it or not, her family is still emigrating to America. At least one immigrant cousin now resides in New York.